The LAMP Stack is a collection of open source software installed together on the Linux operating system to get your website and web application running on it. LAMP or - Linux, Apache, MySQL, and PHP - provides the foundation to host web applications based on PHP and MySQL (like Wordpress, Joomla, Drupal etc.) run on it. In this tutorial, I will guide you trough the steps to install the LAMP Stack with OpenSUSE Leap 42.1 as the Linux operating system. We will Install apache2 with MariaDB and PHP on the server. 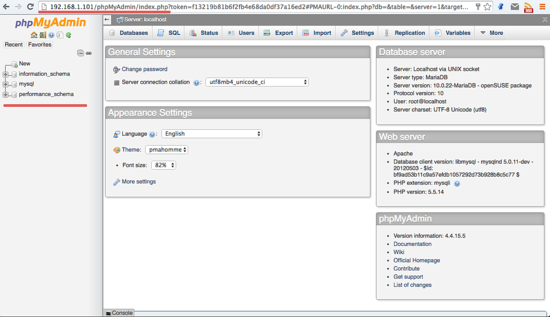 I will include the installation of phpMyAdmin for MySQL administration and secure phpMyAdmin with a .htaccess file. I will use OpenSUSE leap with IP address: 192.168.1.101 on this server. This is most likely different from your settings, so you have to replace the IP with your own IP wherever it occurs. OpenSUSE Leap 42.1 - server. SuSEfirewall2 is based on iptables, it will generate the iptables rules from the configuration file "/etc/sysconfig/SuSEfirewall2". It protects your server from network attacks and unwanted packets. In this step, we will install SuSEfirewall2 and then configure it to allow access to the ssh service and access to apache for web access on port 80. MariaDB is a relational database management system forked from the MySQL. MariaDB is developed by the original developer of MySQL (Monty Widenius) and now has released the stable version 10.1. It has the same feature set then MySQL 5.6 and 5.7. In this step, we will install MariaDB and mariadb-client with zypper and then configure the MariaDB password. 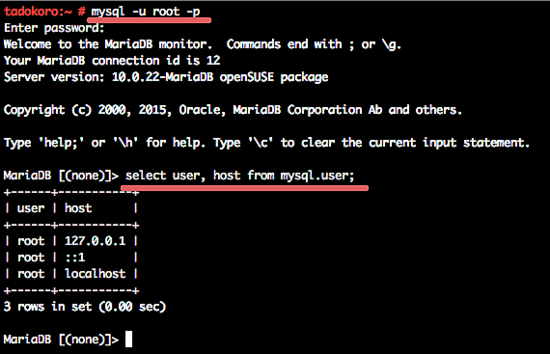 Next, test access to the MariaDB server with the password that we configured above. PHP is one of most popular server-side scripting languages for web development and can be embedded into HTML pages. In this tutorial, I will guide you trough the installation of PHP 5.5 and configure it to work with the apache web server and the MySQL database. a2enmod extension = command to enable apache module. Next, to ensure that php5 and apache are working properly, you can test them by creating a phpinfo file in the document root directory "/srv/www/htdocs/". Go to the directory and create file info.php. Now open your browser and type your server ip and the path to the php info file. 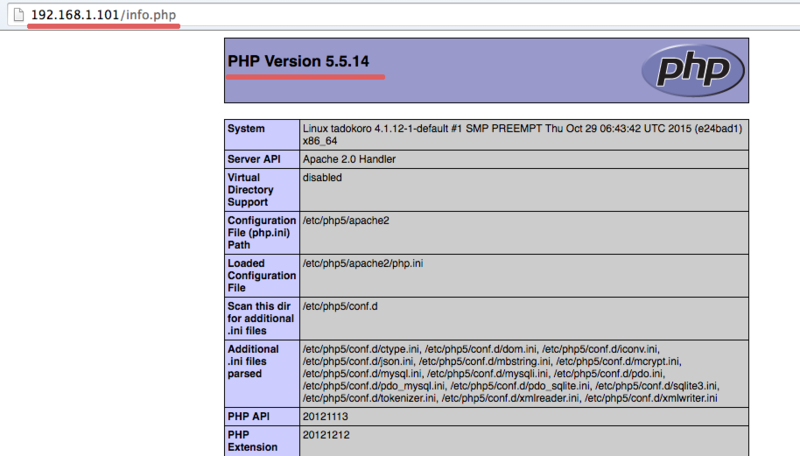 You can see thaPHPhp and apache are working and you can see that the MySQL extension has been loaded. phpMyAdmin is a famous open source software based on PHP that makes us ease to manage MySQL/MariaDB databases from a web browser. It provides a great UI and is easy to configure on many web servers. This step will cover the installation of phpMyAdmin and then we will configure it to make it secure by restricting access with a .htaccess file. Now we will secure phpMyAdmin by restricting access to the phpMyAdmin page with an .htaccess file. AuthType = Type of authentication method used by a user, common method usage is Basic which is implement by mod_auh_basic. AuthName = Directive auth name. AuthUserFile = Directory of .htpasswd file on "/etc/phpMyAdmin/.htpasswd"
Require valid-user = Tell the .htaccess to only give access the restricted directory to the user on .htpasswd file. 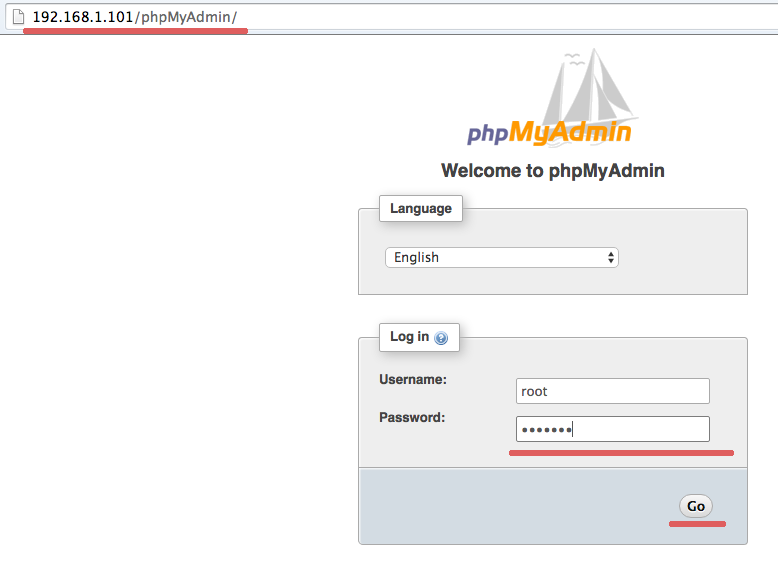 Now in the web browser, type the phpMyAdmin url and you will be asked for the user and password from the .htpasswd file. 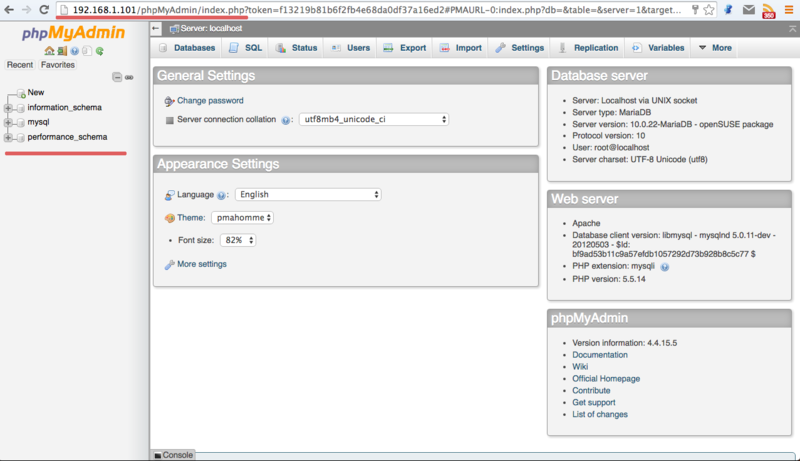 Type in the username and password and press Login so you can log in to the phpMyAdmin. Now type in the MySQL username and password and login. You can see the phpMyAdmin dashboard. Now the LAMP Stack with phpMyAdmin is installed on openSUSE Leap 42.1. Hi There everything was going good untill I got here phpMyAdmin Server error Error 500. Your web site had help me a lot here your explanation is very and understanding good job to all you guys out there. I installed LAMP at the same time as I installed openSUSE 42.3 in order to learn web development on my local machine. I have since also installed phpMyAdmin. I have enabled apache2 using YAST and I get the "It Works!" page. I can also get the phpMyAdmin page that asks for User and Password. The problem is that since I did not get asked to set any mysql password during the instllation (it was installed automatically when I installed the OS! ), I do not know how to do this retrospectively. Can you help please? Thanks for your article. My problem is not with what you've written, but with OpenSuSe Leap 15. The repositories only include PHP7, not PHP5 (which is the version of PHP I need for subsiquent Drupal 7 install). Where do I get the PHP5 code? I can't find anything online. They are all trying to steer me to PHP7, which breaks D-7. I can figure out the zypper command to download the repository. I just need the proper URL. Again, can't seem to find it anywhere.